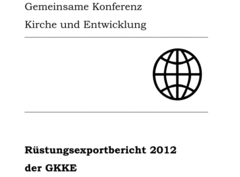 The Joint Conference Church and Development (GKKE) criticized the increase in arms export licenses to third states, i.e. countries outside of NATO and the EU, when they presented this year’s arms exports report at the Federal press conference today in Berlin. At 42 percent, they came to nearly half of all export licenses in 2011. “The exception seems to have become the rule,” Prelate Dr. Karl Jüsten, catholic Chair of the GKKE comments. In 2011, 21.2 percent of individual licenses went to countries receiving development aid. Meanwhile, the number of recipient countries whose human rights situation is considered to be questionable has risen to 64; in 2010, they amounted to 48. Prelate Dr. Bernhard Felmberg on the argument put forward by the German government that exporting arms to partners in conflict regions creates ‘anchors of security’: “It is a dangerous fallacy to believe that deliveries of weapons or war material could contribute to a stabilization (of the situation in regions of conflict).” Such politics are too short-term and overlook problems that can emanate from weapons deliveries. Jan Grebe, new Chair of the expert group on arms exports and researcher at the Bonn International Center for Conversion (BICC) reminded us of the review of the EU’s Common Position of which so much had been expected. Yet it is still ‘open’ whether and how EU Member States will be implementing improved and adapted tools into practice and whether these can promote harmonization of the European arms exports control regime.